Harder. Faster. Stronger. Longer. One of these words has undoubtedly pushed you through a tough workout. Maybe it was when you were dieting down and training with nonexistent glycogen stores, leaving you struggling to find the energy to complete your long workouts or fasted cardio. But before you give in to the fatigue that causes you to stop short of reaching your peak, you should know that there is something out there that can help you find the energy to unleash your inner beast. So what is this secret weapon? It’s an amino acid known as beta-alanine. In order to understand why beta-alanine could be your best-kept secret, you have to understand how it works. Beta-alanine happens to be the gatekeeper of carnosine, a pH buffer that the muscles use. As exercise progresses, there is a significant amount of hydrogen ions that are produced by the contracting muscles. These ions are what cause the “muscle burn” when there is not enough lactate to consume and neutralize them. 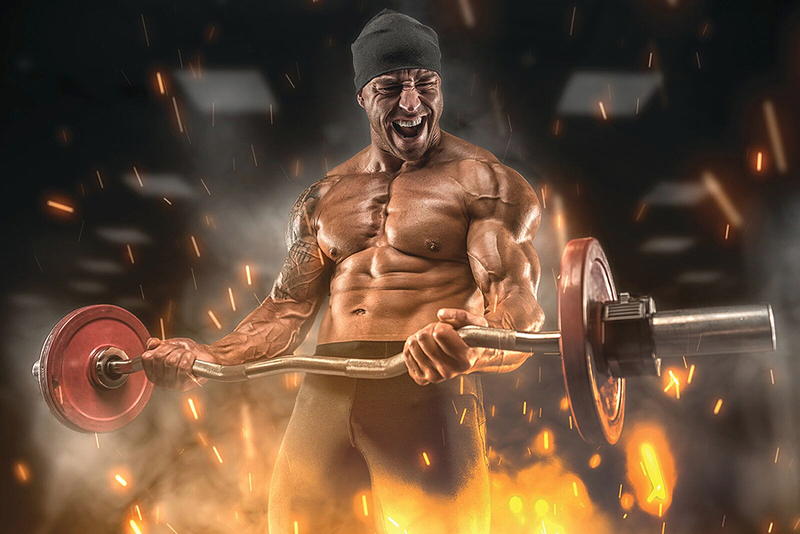 This muscle burn or buildup of hydrogen ions make the muscles and blood highly acidic, which interferes with phosphocreatine resynthesis and inhibits glycolysis. During high-intensity exercise, these two metabolic processes are the main source of energy. Therefore, if they are negatively affected in any way, it will result in reduced force production and increased fatigue. This is why carnosine is such a key asset. It will reduce the acidosis and thereby delay the onset of fatigue. Its concentrations are much higher in fast-twitch muscles, which usually experience the greatest amount of acidosis. Normally, carnosine is only about seven to 10 percent of the muscle’s buffer capacity; however, in elite athletes and bodybuilders, it appears to be much higher. Increasing carnosine concentrations within muscle should lead to an advantage, as you are able to postpone fatigue and train harder for longer; however, research has shown that trying to increase carnosine levels through carnosine supplementation yields no results. Enter beta-alanine. Since beta-alanine is the gatekeeper for carnosine synthesis, is it possible to supplement with beta-alanine, which will then lead to increased muscle carnosine levels and thus delay fatigue? The answer appears to be yes. In fact, it has been shown that four to 10 weeks of beta-alanine supplementation leads to a 60 to 80 percent increase in muscle carnosine levels. This increase appears to be dependent on the dose you take. It was also demonstrated that when beta-alanine supplementation stopped, there was a linear decline in muscle carnosine levels of two percent per week. Specifically, beta-alanine supplementation leads to improved exercise endurance, increased torque (rotary force), increased lean body mass, increased training volume, and increased muscular endurance. This means you get to those last few reps with a little more strength, and maybe even get that extra set you’ve been saving for later leading to greater strength and power gains. But there does appear to be a time and fitness effect. Beta-alanine supplementation delivers a performance boost on exercise that lasts between 60 and 240 seconds, with smaller effects seen for exercise longer than 240 seconds and shorter than 30 seconds. So that’s good news for those of you beasting in the gym and putting the weights on blast. It appears that’s where beta-alanine supplementation is going to have the most benefit; although, it is not going to benefit long endurance training the way it does with weightlifting. Also, trained individuals are going to experience a more pronounced effect compared to untrained people. This may explain why elite athletes and bodybuilders have higher muscle carnosine levels as adaptation occurs with training. But don’t worry, if you’re just getting started, keep going. Those carnosine levels will slowly build up and pay off during those intense workouts. So how much should you take? Well, we already know that there is a dose-response relationship between beta-alanine supplementation and muscle carnosine levels. Essentially, the more beta-alanine you take, the greater the amount of muscle carnosine. Nevertheless, it’s recommended that about four grams a day of beta-alanine be taken to see an ergogenic effect but not more than about eight grams a day. Unlike BCAAs, beta-alanine is not something that works best when ingested during fasted cardio. It was determined that beta-alanine supplementation increased muscle carnosine levels more when ingested with a meal compared to between meals. It is believed that insulin plays a role in muscle carnosine loading. So ingesting beta-alanine with your high-glycemic meals is the best way to absorb it. Take note: Acute supplementation (such as a single dose) has no effect on exercise performance and fatigue. Chronic supplementation of at least four weeks seems to be the threshold, although some individuals may feel an effect sooner, while it may take longer in others. After four weeks, it is advised to maintain elevated muscle carnosine levels with a maintenance dose of about 1.2 grams of beta-alanine per day after the four-week loading period. Muscle carnosine levels decrease relatively quickly, so this maintenance dose is crucial for prolonged success.